KAMPALA – “I have done good preparations and i will try my best to win Gold for Uganda, said Joshua Cheptegei days before departing for the 2018 Commonwealth games in Australia. What happened a week later, was something he must only have dreamt of when he was still a child, aspiring to become a top athlete. The 22 year old had become a Commonwealth double champion as he won both the 10k and 5k races, in a field that featured some of the best runners in the world. 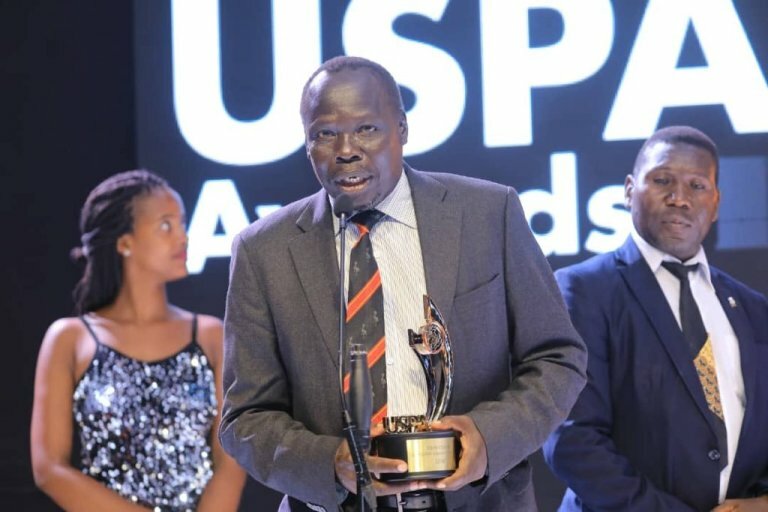 Over a year after his incredible achievement in Gold Coast, Australia, Cheptegei was on Friday, 05-04-2019, voted the Uganda Sports Press Association (USPA) best Sports personality of the year. This happened during a glamorous awards’ dinner held at the Imperial Royale Hotel in Kampala. Cheptegei, who was present at the awards, fresh from the World Cross Country championships in Aarhus, Denmark where he won Uganda’s first ever Gold Medal in the Men’s Senior race, was all smiles and expressed his gratitude towards being named the best. “This is a big honour to be named the best of all sportsmen in the country, said the soft-spoken Cheptegei. “Personally, this award motivates me. At the same awards, Cheptegei was also named the male athlete of the year while Stella Chesang scooped the female title. To win the award, the Double Commonwealth champions beat off competition from Rugby Cranes player Phillip Wokorach, She Cranes netball ace Lillian Ajao and Uganda Cranes captain Denis Onyango. As consolation, Ajao, Wokorach and Onyango were named the best in their respective sports circles. Meanwhile, Phillip Wokorach became the first sportsman to win the Uganda Sports Press Association (USPA) fan’s choice award. The category that was introduced for the first time and the fans had to vote online. Wokorach. who was absent on the ceremony because he is away with the national 7s team in the HongKong series, was also named named the best male rugby player of the year. In the same vein, veteran Tennis player now turned coach John Oduke took home the USPA legendary award. Oduke gives a brief speech after receiving his award on Friday. Oduke, 51, won an unprecedented 13 Uganda Open titles, the last coming in 1996. “I am privileged to have been recognized with the legendary award, said Oduke. “I thank the main sponsors (Nile Special) and all the other partners as well as USPA for recognizing me. Federation of Uganda Football Associations (FUFA) was named the most outstanding federation of the year as the Africa Paralympic badminton tournament at Lugogo won the best sports event of the year. All the respective excelling sportsmen and women in the various disciplines were also awarded. The guest speaker on the night, Hon. 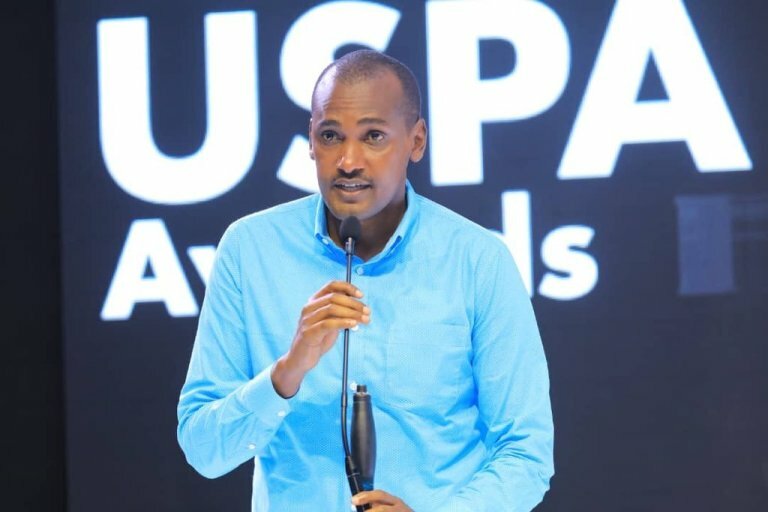 Frank Tumwebaze stressed that Sports should continue being taken serious and thanked USPA for recognizing it’s best. 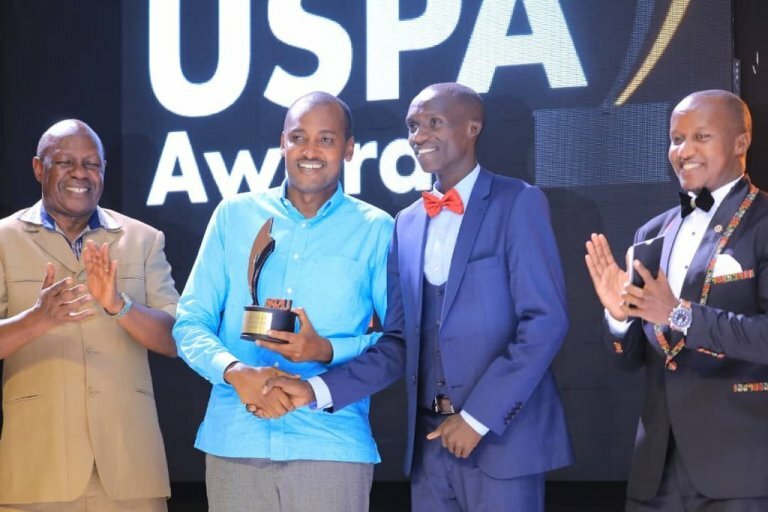 “It is a good USPA recognizes the best outstanding sportsmen, said Mr. Tumwebaze. “Sports now needs to be taken seriously as an independent profession. “When I was studying at college, there were boys who were always playing outside class. “We despised them and thought they were failures. Let’s transform sports from leisure to professions. Hon. Tumwebaze speaks at the USPA Gala on Friday. USPA was founded in 1970.